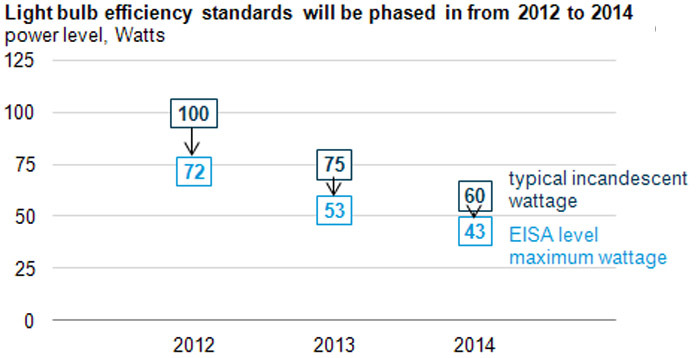 On September 1, 2013, the latest energy efficiency requirements for LED lights will be officially implemented in Europe. European energy efficiency requirements are mainly based on the requirements of the EUs ErP. Like LVD Directive and EMC Directive, ErP directive has also been incorporated in the EUs CE system. Therefore CE mark can be printed on the nameplate only after the related products involved must meet ErP requirements and a designated agency is responsible for market surveillance, which is a mandatory EU requirement. In view of LED lights, after EU had introduced EC244/2009 for non-directional light sources (halogen lamps, fluorescent lamps) and EC245/2009 for fluorescent tubes, ballasts and luminaries composed accordingly in 2009, it launched EU1194/2012 for all LED bulbs and directional light sources. Next, the second phase of the implementation of this requirement is September 1, 2014, and the third stage is September 1, 2016. Lighting Facts label, Energy Star and DLC belong to voluntary requirements; inCalifornia, the special requirement of portable LED work lights to meet theCaliforniaenergy consumption is mandatory. As the worlds major LED application base, the market space in Europe and theUnited Statesis vast, but also it proposed strict requirements on the LED lights and LED lighting energy efficiency test. On the other hand, the energy efficiency requirements of the current LED bulbs and lamps inU.S.focused on Lighting Facts label, Energy Star and DLC. Lighting Facts label is to make lighting products to more specific and more credible, to tell customers the products performance parameters from five aspects, the lighting facts issued in October 2012 has added two optional indicators. Energy Star was created in 1992 by the Environmental Protection Agency and the Department of Energy during the Clinton Administration and designed to identify and promote energy efficient products. EPA regular random spot checks annually on all ENERGY STAR products from the market, the unqualified products will be immediately canceled the Energy Star and entitled to allow manufacturers to make further compensation for consumers. U.S.energy efficiency standards have requirements on energy efficiency test and laboratory qualification, it must be independent third party, the test data and reports laboratory issued are effective only when the products are accredited. LED exporting enterprises facing barriers of energy efficiency standards for European and American markets have a lot of work to do to gain a firm foothold in the global market. As a professional third-party testing and certification organization, Intertek recommends companies to pay close attention to the relevant international standards, conduct technological upgrading and product transformation within the specified time, in order to reduce unnecessary business risks.